As I wrote when the 155mm version of this tractor came out, back in 1957, when I was nine the only good way to make money was off my report card, as I had a wonderful grandmother who believed that “bribery works wonders.” As such, other than birthdays, Christmas, and a stray generous uncle or two it was the only time I could get enough money together to buy “expensive” model kits. In the fall of 1957, for my first good report card, I made enough to afford a good spree and went to my local model shop. The first thing I saw there for the princely sum of $1.98 and no tax was the brand new Revell Kit No. H-532, the “Long Tom” artillery piece set. For a 9-year-old, this came with a “tank,” a big gun, a wheeled thing, and five little men – how cool is that?! I loved that model and really had a good time with it, but eventually it bought the farm as did many others (a problem which was exacerbated the year I got a Daisy Model 111 BB gun.) But I never forgot it and when I grew up wanted to do one in 1/35 scale. 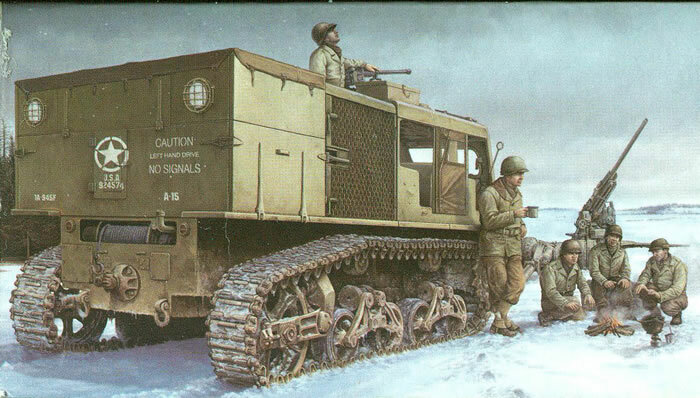 Alas, there were two major problems: number one was no 1/35 scale 155mm gun kits, and only one really crummy model of the M4 18-ton High Speed Tractor (the “tank” of my youth) from Nitto of Japan. This was merely a pantographed version of the old Revell/Adams kit with a motor added and rubber band tracks. Eventually, when AFV Club came out with their great kit of the M2 (AKA M59 in its postwar MAP version) I tried to tackle converting that kit to an accurate M4 HST. I gave up as it would have to be totally scratchbuilt. I also passed on the resin one which came out about three years later as it was too much for my budget. The lower hull is a nice replication of the original, and using etched brass gives the modeler the options to have two vents at the front of the hull either open or closed. The idler wheel consists of three parts (center and two rims) to capture the welded structure accurately. (Note that while the suspension LOOKS like that of the American M3/M5 light tanks, it is more closely related to that of the M4 medium and has most of its parts interchangeable with them.) The bogies are nicely done with good wide wheels and a heavy HVSS spring assembly. The tracks are somewhat thin versions of the T49 Sherman track (three-bar cleat) type which was the most common one used on M4 HST vehicles. They are okay but many modelers will opt for single-link ones from RHPS, Model Kasten, or Fruil. The rear section of the hull is provided with a wealth of interior details, such as the winch, the big Waukesha gasoline engine, and all of the engine systems. Since the bay is painted white and the vehicle has large side grilles, this helps show them off once completed. The side grilles are someone simplified to get them to turn out as etched brass (the real ones have at least two layers from photographic evidence) but this should not look too bad on the finished model. The model also gives the modeler the option to either leave it open or “button it up” with a full set of canvas doors and panels. They also provide masks for painting so the windows may be installed prior to finishing, a nice touch. The hardest steps in the model’s construction will be the forming of the headlight (front) and floodlight (rear) lens guards from etched brass, as the originals are domed. I suggest seeking out something about the size of a pencil eraser and using it to shape the guards before installation. The Type A rear body consists of lockers for stowing single AA rounds and a bin on the top with a rear tailgate for other stowage. The kit provides a heavy grille for the locker interior but nothing for the bin and no ammunition for the lockers. The model comes with two finishing options: A Battery, 945th Field Artillery, 1st Army. This was a non-divisional 155mm gun unit that fought in the ETO from July 1944 to V-E Day, so it is an odd choice as the tractor is an antiaircraft one. (It appears it was based on a restored Type A vehicle with the wrong markings.) The other finishing option is overall OD with “18 TON HIGH SPEED TRACTOR - 28" on the front bumper and starts and registration numbers only. I recommend getting a copy of “High Speed Tractor” by David Doyle from Ampersand Publishing as it is a good reference for these vehicles. Overall, this is a great kit and answers the mail and now it finally has a job to do with the new Commander Models gun. Thanks to Miin Herng Tsueng for the review sample.